Want to press more and look the part? Try these 4 simple out-of-the-norm triceps exercises that'll jump-start your upper-arm gains! All that "detail work" you've been doing on your triceps is great for a pump and some arm size. But is it actually translating into stronger triceps—and a stronger bench? If your triceps work goes no further than the cable stack, probably not. Want some serious movements to beef up those horseshoes? You need to talk to powerlifters. These four exercises have helped me construct the arms of some of the biggest and strongest people in the world, and there's no reason they won't work for you, too. The Sling Shot is the creation of the always innovative powerlifter Mark Bell. This apparatus is a supportive mechanism for the upper body that allows you to handle more weight while bench pressing. The basic Sling Shot allows a lifter to handle about 10 percent more than their actual max. In other words, 270 pounds basically becomes 300. If your shoulders just winced at that description, fear not. The Sling Shot is designed to reduce the stress on your chest, shoulders, and elbows while placing an overload directly on the triceps. Because of the herculean loads being used and the reduction of chest and shoulder contribution, triceps growth is a foregone conclusion! The Sling Shot has no learning curve; just throw it on and it's time to get it on! It's a great standalone movement, or as Craig Koffler shows in this video, you can use it to get some reps after a lower-rep overload movement such as paused bench press. You can use the Sling Shot across different rep ranges. To train for strength, go as heavy as possible for 3-5 sets of 1-3 reps. For a mix of strength and hypertrophy, do 2-4 sets of 4-6 reps with maximum intensity. For maximum hypertrophy, perform 3-4 sets of 8 or more reps.
To amplify its effects on the triceps, perform Sling Shot bench presses with a relatively close grip. Board presses are used primarily by powerlifters for the purpose of getting used to handling heavier weights and targeting specific sticking points and ranges of motion. Bodybuilders can use them for the same reason, while also making some customizations for muscle growth. My favorite are mechanical-advantage dropsets. You start a set with the hardest version of a movement, then switch to a more favorable one once you reach muscle failure. For our purposes here, that would mean reducing the range of motion incrementally by adding boards after every few reps, because it's easier as you increase the thickness of the boards. The bench press has an ascending strength curve, meaning the closer the barbell is to lockout, the more you can lift. In other words, you're weakest at the bottom and strongest at the top, and that bottom position is what limits the amount of weight you can use. Board presses circumvent this limiting factor by reducing the range of motion, so you blast the triceps with the overload they don't typically see. Like a regular close-grip bench press, take a grip that's about 2-3 inches closer on each side than your normal grip. Perform the lift by lowering the barbell to the boards, then pressing it up to full extension as explosively as possible. Use different board heights to vary your workouts. Most lifters will thrive using 2-5 different board depths. 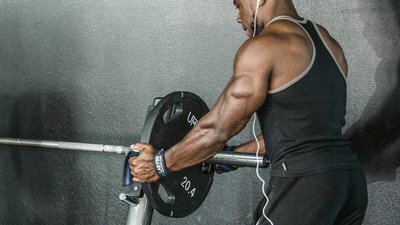 If strength is your objective, train as heavy as possible for 3-5 sets of 1-3 reps; for hypertrophy, do 3-4 sets of 8 or more reps. For a combination, choose set and rep ranges that fall somewhere in between. Jeremy Hoornstra, the best bench presser of all time and my longtime client, made this video on how to make your own set of boards—all five depths in one piece of equipment for less than $10. Anecdotal feedback from my top lifters suggests this movement is more elbow-friendly than other extension variations. But it isn't any less intense. On the contrary, it overloads the triceps more than a traditional extension, because the decline creates a longer range of motion and a deep stretch. A muscle under stretch is muscle being overloaded! However, many barbell or dumbbell exercises with an "increased" range of motion just overload the bottom portion of the movement and require less effort to reach full extension. Cables require continuous tension throughout the entire movement, so there's no diminishing tension as you raise the weight. This extra time under maximum tension will spark greater growth, which is why I use them with great bench pressers like powerlifter Peter Edgette. Perform this movement on a shallow decline bench that's angled about 15-20 degrees. Lie on the decline bench and grab the rope attached to a lower pulley. It's easiest to have someone hand the rope to you while you're lying down. Start at the top, in an arms-extended position and with your elbows in. Lower the rope in a semicircular motion just behind your head as if doing a skullcrusher. Feel a deep stretch, then extend your arms back up by contracting your triceps and repeating. To build strength, perform 6-8 reps for 3-5 sets. For hypertrophy, do 10-15 reps for 3-5 sets. Remember, this is not a power movement, so keep it controlled. Any sacrifice in technique is a sacrifice in gains. As a finisher for triceps and a way to take a T-shirt-popping pump to the next level, take your 15-rep max and do it for 8 sets of 8 with just a 30-second rest interval between sets at the end of your triceps workout. Don't reduce the weight unless you reach muscle failure prematurely. The dip is an old-school movement that's still one of the best to build up your arms. In Per Tesch's book, "Target Bodybuilding," magnetic resonance imaging (MRI) demonstrated that dips maximally target all three heads of the triceps. Few other movements can say the same. This is why they're a staple of all types of strength athletes. So what's the next step after you can bust out reps with your body weight? Adding additional resistance, of course. But here's an approach you may not have considered: taking that Sling Shot you use for your bench press and using it for weighted dips! It turns out that the Sling Shot has all the same benefits for dips that it does for the bench: You'll be able to use more weight and target the triceps even harder, while reducing strain on the pecs and shoulders. And yes, this technique can also pay off for those in the process of mastering dips with body weight. Here's Big Al Davis doing Sling Shot dips with 305 pounds for 8 reps at a body weight of 310 pounds. That's a serious dip! Some lifters with shoulder issues should avoid dips. That being said, dips often get a bum rap because of "excessive range of motion." Here's the solution: From the arms-extended position, lower yourself until your upper arms are no more than parallel to the floor, then press back up to the starting position. Don't go any deeper than that. For strength, dips should be done for 2-4 sets of 4-6 reps; for a mixture of strength and hypertrophy, do 2-4 sets of 6-10 reps; and for hypertrophy, instead of counting reps, perform as many reps as possible in a given period time. A great (but brutal) starting point is 1-3 sets of 30-45 seconds. If your body weight won't do the job, add weight via chains or a dip belt. If you're not quite ready to dive in with your body weight, give band-assisted or machine-assisted dips a shot. I have yet to meet a Bodybuilding.com reader who doesn't want bigger arms or greater pressing prowess. But triceps can be stubborn, and they often need a serious stimulus in order to grow. These four movements give you just that!